The G25 is the high-spec engine variant in the Mazda3 line-up and is available on the Evolve grade, the GT grade and top-of-the-range Astina grade. Prices start at $29,490 for the G25 Evolve, step up to $33,490 for the GT and $36,990 for Astina. Those prices are for cars with the manual gearbox, but just add another $1000 for the automatic transmission. The G25 is a 2.5-litre four-cylinder engine making 139kW/252Nm. Coming standard on G25 cars is a power adjustable driver seat, a head-up display, an 8.8-inch screen, reversing camera, rear parking sensors, sat nav (GPS), adaptive cruise control, proximity key, Apple CarPlay and Android Auto, digital (DAB+) radio, Bluetooth and steering wheel mounted controls. The G25 Evolve has cloth seats while the G25 GT and G25 Astina have leather seats. Want a sporty-feeling family hauler, but don't want to go for a full hot hatch? 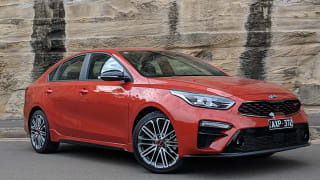 Enter the Kia Cerato GT sedan. We put it to the family test.